In this week's episode, Mike talks with Gary Oppenheimer, the Executive Director and Founder of Ampleharvest.org, a self described aging geek, he has worked with computers and communications going back to the 1970's. As director of a community garden in 2009, he learned about the wasted food in many plots and created a program called "Ample Harvest" to get the excess food to local food pantries. Realizing this as a nationwide problem, he created a nationwide solution called Ampleharvest.org to use the Internet to educate, encourage and enable millions of growers nationwide to share their ample harvest with local food pantries in all 50 states. While more than 50 million Americans live in food insecure homes (including a quarter of all children under the age of six), more than 40 million Americans grow fruit, vegetables herbs and nuts in home gardens - often more than they can use, preserve or give to friends. Struggling to feed their families, many Americans, both those chronically economically challenged as well as those now impacted by the economic downturn have come to rely on the more than 33,500 food pantries (also called food shelves, food closets, food cupboards or food banks in some areas) across America to help feed their families. These food pantries, relying on donated and purchased foods, almost never have fresh produce and instead rely on canned or processed produce shipped from across the country at significant cost, both economic and environmental. At the same time, millions of home and community gardeners nationwide with an abundant harvest do not know that they can share their harvest, do not know how to share their harvest and do not know where to share their harvest. Ampleharvest.org solves that for them. Ampleharvest.org envisions an America where millions of gardeners eliminate malnutrition and hunger in their own community. Ampleharvest.org, moving information instead of food to diminish hunger and malnutrition in America, is educating, encouraging and empowering growers to share their excess harvest with the needy in their community instead of letting it rot in the garden. Our "No Food Left Behind" goal is a healthier and by extension, wealthier America. So here in Ohio we have had a wickedly cold winter. Today it is still just 27 degrees. When should I think about getting my garden ready for cold weather plants like broccoli and brussels sprouts? You should be tending to your soil throughout the year anytime it can be worked. Adding in compost, vermicompost, organic material and so on. When trying to figure out when you should start your garden, and I am focusing here on starting seeds indoors, there are two ways that you can figure this out. Here is the picture of what the zone map looks like. It has changed in recent recent years, adding more detail. I don't have Brenda's zip code, but I do have her state, in this case Ohio. 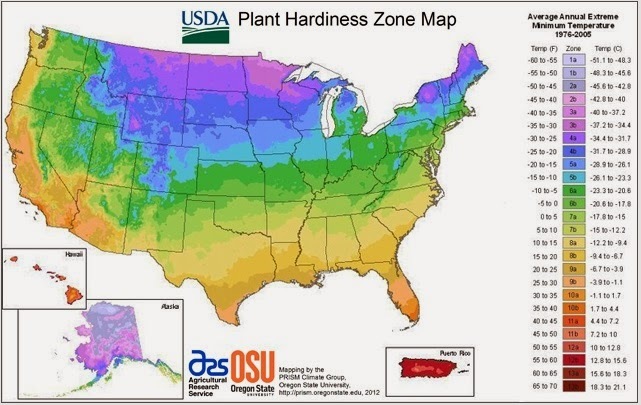 Ohio has three growing zones associated with it, 5b, 6a and 6b, as shown below. That is the first way, however a better way to calculate when your area will be ready for gardening is to visit the NOAA Climatic Data Center and click on your state in the box on the lower left side of the screen. In this case Brenda would select "Ohio". After doing so, a new window will open with a PDF labled "Freeze/Frost Occurrence Data" for the state of Ohio. This PDF will list all of the climate data you have ever wanted, and a lot of data that you never knew existed. Once you know when the last frost will be in your area, and when frost will hit you again in the fall/winter, planning your garden becomes much easier. You will know how long your gardening season is. Once you know the length of your gardening season, you can calculate when to start your seeds indoors. On the back of your seed packet it will tell you "Days to Maturity" or DOM. Knowing this will tell you when you should start your seeds indoors so can get a jump start on your seeds to make sure you have enough time to reap a harvest. In this week's episode, Mike talks with Vincent Suozzi, a middle school teacher from Long Island, turned inventor of a really cool and useful weeding tool. From the word "go", you will hear Vincent's passion and enthusiasm, as he takes you on his journey from his product being just an idea, up through his widely successful Kickstarter campaign. His garden tool, called the Ring Weeder, was chosen as Yahoo! Home's top 10 kickstarter campaigns for new garden products. Since that time he has been interviewed for local and national news outlets, as it seems everyone wants to know more about Vincent and the Ring Weeder. Hi I'm Vinnie and I currently work at Westbury Union Free School District in Westbury Long Island. I teach 6,7 and 8th grade Physical Education and Health. I also have been in the Landscaping business for over 30 years. I specialize in flower design and rose care. I'm married to my wife Anna for 30 years and have 2 sons, John 26 (graduate of Drexel University in Philadelphia) and Stephen 23 (graduate of The George Washington University in DC). I love teaching and I love designing flower gardens. I have the best of both worlds. I’m always thinking of new and creative "out of the box" activities for my students. I also apply this creativity when it comes to gardening. This is how I came up with the Ring Weeder. If Edward Scissors hands can do it, why cant I? 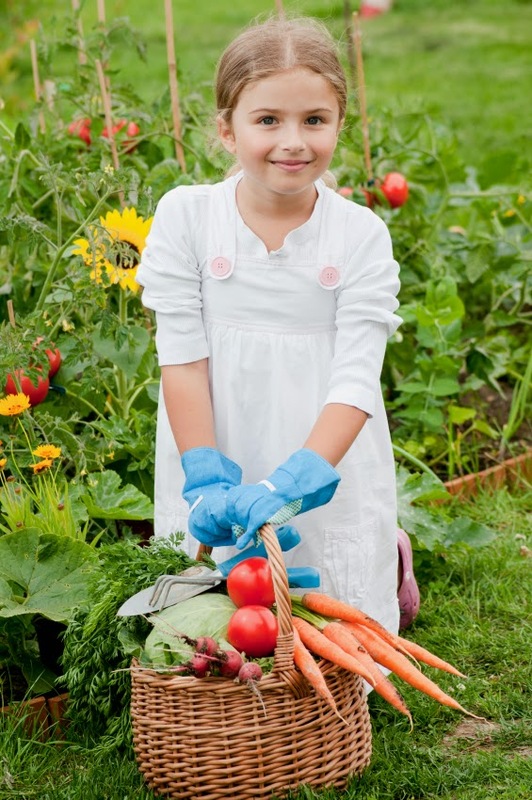 Should gardening be taught in schools? However, I think it is a great debate question. Let's face it, food is "kind of" important and if we can teach our youth where it comes from, how to grow their own, I believe it will go a long way for a more sustainable future. And if gardening is taught in schools, should it be a mandatory class or an elective? I would like to get your thoughts on this? Comment below and let me know. In this week's episode, Mike talks with Holly Baird of the Wisconsin Vegetable Gardener. Mike and Holly discuss gardening in an urban environment. Holly will fill you in on some great information if you are limited on space, if sunlight is scarce and touch on some of the plant diseases you may have to face and some tips to overcome them. Joey & Holly Baird are the founders of The Wisconsin Vegetable Gardener. They are a married couple living in southeastern Wisconsin (just outside of Milwaukee). Joey & Holly make videos on youtube about how to grow your own food organically, reusing found items (or items you may just throw away), what to do with the food you grow, home canning and simple home living. Along with traditional ground gardening they also grow indoors year-round using up and coming methods along with winter growing in cold frames and low tunnels. Their goal through their videos and social media pages is to show the average person how easy it is to grow food, store food, and reuse everyday items. Their motto is “for the average gardener, simple home living, and using what you already have”. Joey and Holly enjoy speaking at garden expo’s throughout the midwest. Holly is also an award winning home canner with a handful of ribbons from the Wisconsin State Fair including a Best of Show award for her home canning talents. Here in New Jersey we are getting closer and closer to vegetable gardening season. While many are starting their seeds indoors right now (me included), when I say vegetable gardening season is closer, I mean working outdoors. The ground here is still a little too “frozen” to do anything, and we actually still have loads of snow still sitting around. I am guessing over the course of the next couple of days of warmer weather we are supposed to have, both issues, will be solved. While I wait for that though, I thought having a nice outdoor fire would be a good thing to warm the spirits. And as luck would have it, I can still relate a warm cozy fire with vegetable gardening. You see when that fire is “done”, I can use the wood ash in my compost pile or mix it into my garden soil. Wood ash contains a boatload of nutrients that can be amended to your soil beyond the source of lime, and potassium. Keep in mind, that while wood ash is great for your soil, coal ash is terrible. Avoid ash derived from coal at all costs. 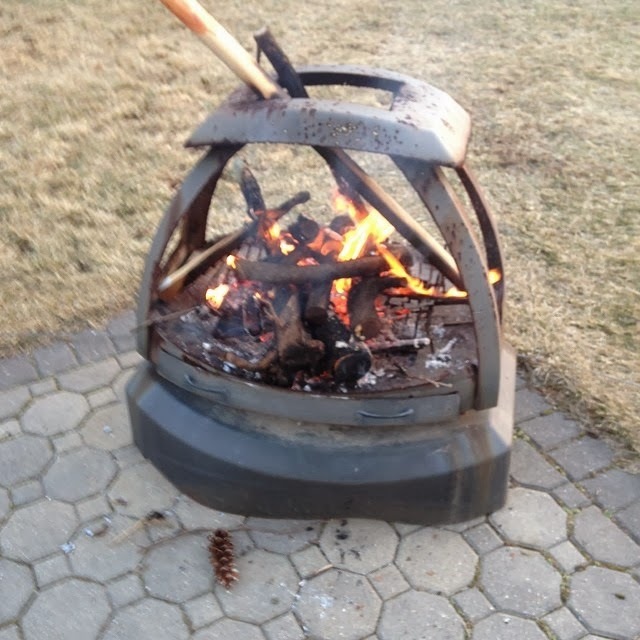 So, if you are like me and are waiting for this polar vortex winter to end, light a fire, burn a few logs, and then use that leftover ash in your garden. Mike Podlesny is the author of Vegetable Gardening for the Average Person: A Guide to Vegetable Gardening for the Rest of Us, the moderator for the largest vegetable gardening page on Facebook and creator of the Seeds of the month Club. In this week's episode, Mike talks with Carol Niec and Kerrie Rosenthal about the Seed Keeper Project. The Seed Keeper Project, now in its 4th year, is a way to recognize the outstanding work schools are doing in getting kids from Kindergarten through 12th grade, involved in vegetable gardening. People are noticing the fabulous work these two ladies are doing as their efforts have been recognized on a national level that is discussed in the podcast. You won't want to miss this episode! A special prize each school will win - JUST ANNOUNCED IN THIS PODCAST! The Seed Keeper Project is our opportunity to recognize school gardens across the country. Each year we award a Seed Keeper Home Farmer and a Certificate to a school in every state and the District of Columbia highlighting their dedication to gardening. Beginning February 3, we will post 10 States each week for 5 weeks in alphabetical order on our FaceBook Page The Seed Keeper Company. During the week we ask you to nominate a K-12 school, any type of school, and post it on our FB Page. We will draw a winner using random.org at the end of that week and announce them on our FB page. When we send the Seed Keeper and Certificate to the winner, your name will be mentioned in the Certificate as the person who nominated the school. We believe it our responsibility to take part in educating coming generations about the benefits of gardening and particularly growing your own food. In the meantime, we hope you'll peruse this page where we share some of the responses and accolades our project has received ( including The U.S. Department of Education) along with the 2010 and 2011 winners lists. 2013 list coming soon!! In this week's episode Mike talks with gardening expert Shawna Coronado. A finalist for the Better Homes & Gardens top 5 gardening bloggers and key note speaker at the Chicago Home & Garden Show, Shawna will share all kinds of great tips, tricks and techniques on gardening. Shawna will cover the various beneficial plants that can attract pollinators and how to arrange them in such a way to not not only make the garden productive but attractive. Shawna refers to this type as an ornamental edible garden. 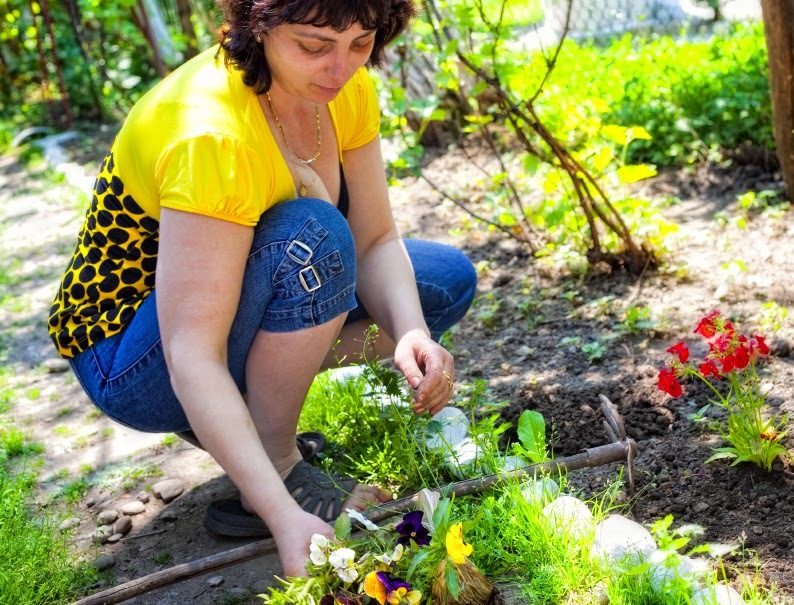 Shawna will also talk about front yard gardens and the proper steps to take to make sure they are done right and not intrusive to your neighbors. Finally, Shawna and Mike will finish off the podcast talking about how you can take your many extra vegetables that you are growing and help those in need right in your area. Shawna Coronado is an author and professional photographer. She is also an on-camera spokesperson, newspaper columnist, internationally recognized keynote speaker, environmental and health correspondent with over eighteen years of experience with sales, marketing and public relations. Shawna speaks internationally on building community, simple living, and green lifestyle tips for the everyday person as well as social media development. Most recently, she has lectured at TEDx and Google, discussing the benefits of green living for community. Shawna Coronado educates the online community on eco-travel, green-living tips, sustainable gardening, inexpensive cooking, home vegetable production, and techniques for every day homeowners to save money by being green and feed the hungry during a down-economy – all this right from her very own home and ornamental front lawn vegetable garden. Her goal with the blogs and online presence is to better the world through community involvement and simple green living. Currently, Shawna has over 15,000+ followers on Twitter, over 50,000 followers on Google+, and over 5,000+ followers and subscribers on Facebook. She has more than 170 videos on YouTube and her videos have had more than a half million uploaded views on YouTube and continue to grow daily. Shawna is a CitySearch Guide and has written for dozens of online magazines including Better Homes and Gardens and ChicagoNow. She has been ghost blogging, tweeting, and writing for over five years for corporations and individuals across the internet. Shawna appears regularly on national American TV. She has been featured on many news channels, including ABC News, WGN 9 News (Chicago), PBS TV – Growing A Greener World Episode 126, PBS TV – P. Allen Smith’s Garden To Table, WCIU TV, NBC News Dallas/Fort Worth, FOX News Albuquerque New Mexico, KOB TV New Mexico, Lawrence Media TV- LJWorld.com, Oklahoma Gardening TV, Local Access 10 TV, WGN Radio, The Mike Nowak Radio Show, The Chicken Whisperer Radio Show, Garden Life Radio, and More Hip Than Hippie. Ireland radio show features include Marty Whelan/RTE Lyric FM Radio Show, and Tom Dunne Morning Show on Newstalk 106 and is a regular guest on The Sodcast with Peter Donegan out of Dublin, Ireland. Special written features on Shawna can be found on CNN Health, Chicago Tribune Local, The Daily Herald, and other media spots all over the internet.